As the 2016 America’s Cup World Series begins drawing to a close, the Defender and five challengers are increasingly turning the focus of their efforts to the Cup itself: as is evident in the launching of various “prototypes” designed to both hone their skills and further develop whatever technologies they may be working on. Basically AC45s on steroids, the boats are necessary because the current America’s Cup protocol prohibits any team from sailing an AC Class 50-footer before December 26. Although the design parameters for the hulls of the AC 50-footers are somewhat limited (with an eye toward reigning in costs) such critical features as the wing, rudders, foils, fairings and the electronic and hydraulic control systems are free of constraints and very much in need of real-world testing. “With this boat, we’ll move up from calculation to measurement. 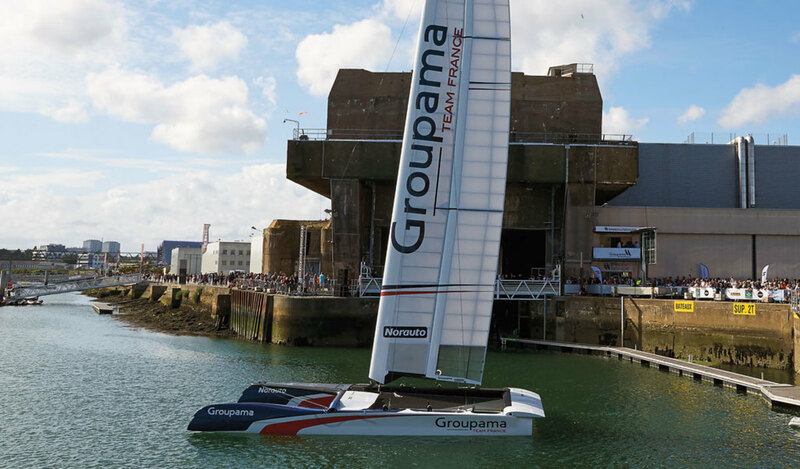 It’s about applying intelligence in our quest for performance, creating the fastest boat of its age,” says French offshore legend Olivier de Kersauson, a member of the management team for France’s Groupama.